During a recent trip to New Mexico, I purchased a small geode for my grandson. This was a do-it-yourself geode, one that we have to break or saw in two ourselves. Geodes are “hollow, vaguely spheroid to oblate masses of mineral matter.” The most distinguishable characteristic about geodes is the striking difference between their outward and inward appearance. On the outside geodes tend to be tan-colored, gray, or brown. They’re rather ugly and have no outward appeal. 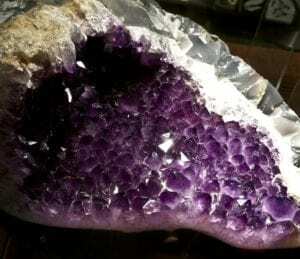 Yet once they are broken or cut open, their insides often reveal a cluster of beautiful crystals. It’s often said that you cannot judge a book by its cover. Nor can you judge a person’s character and attributes by their outward appearance. Like the geode – which is ugly on the outside and beautiful on the inside – the outward appearance of many people is very misleading. Their size, shape, color, and gender may immediately turn us off. Yet, if we dig a little deeper and get to know them, we may find them to be a gem of a human being. “The physiognomic analysis of … his face reveals … his immense kindness. Yes, [he] is kind. Look at him in the midst of children, bending over the graves of those he loved; he is immensely kind, I repeat it.” Who was he describing? Adolph Hitler. No, you cannot judge a book by its cover. The Bible records the story of God sending the prophet Samuel to Bethlehem to anoint one of Jesse’s sons as king over Israel (1 Samuel 16). Jesse first presented his oldest son to Samuel, Eliab. Eliab was a fine physical specimen of a man – tall and strikingly handsome. His outward appearance was so impressive that Samuel said to himself, “Surely this man is the LORD’s choice for king” (1 Samuel 16:6). But God immediately said to Samuel, “Do not look at his appearance or at the height of his stature, because I have rejected him; for God sees not as man sees, for man looks at the outward appearance, but the Lord looks at the heart” (1 Samuel 16:7). Jesse brought seven of his sons to stand before Samuel. But God rejected them all for the job of Israel’s king. Only at Samuel’s urging did Jesse reluctantly bring forth his youngest and smallest son – David. Though he was undistinguished, God chose him as king. Though he was the runt of the litter and the least physically impressive, yet God saw David’s heart. He saw that David was humble, teachable, and zealous for the LORD. Please be slow to judge others based on their physical appearance. We are even told about Jesus that, “There was nothing beautiful or majestic about his appearance, nothing to attract us to him” (Isaiah 53:2). Yet in that unattractive physical frame dwelt all the fullness of God in bodily form (Colossians 2:9). Only on rare occasions did His deity shine through the veil of His humanity (e.g. His transfiguration – Matthew 17:1-8). Most of the time people failed to recognize Him. As the Scripture tells us, “He was in the world, and the world was made by Him, yet the world did not recognize Him” (John 1:10). Almighty and merciful Father, I humbly ask You to open my eyes to the goodness and greatness that lies within those I interact with. Help me to appreciate the quality of each person’s character and soul. Most of all, dear Father, do not allow me to overlook the greatness and glory of Your holy Son, Jesus Christ, who is my Creator, Redeemer, and King. Amen.